Marinated in ponzu sauce. I loved this. Fresh and light, and still had lots of flavor. The albacore literally melts in your mouth. With the warm rice underneath and the cool fresh fish on top, it literally melts in your mouth. The albacore had a ponzu marinade so it didn’t need soy sauce. This originally came with salmon sushi but I don’t like salmon so I substituted bay scallops for it. The Bay scallop sushi was also great- the rice was warm underneath and the creaminess of the scallops made it the perfect combo. This had flavor too so no need for soy sauce. This was my favorite sushi of the night. The yellowtail and halibut and a crisp citrus marinate. Both melted in your mouth. I especially love halibut because of its tenderness. Both such great fishes, and because its such good quality fish the light sauces on them were just enough. Perfection! I usually don’t like seaweed. I get soy paper, but for some reason I really liked the handrolls at Sugarfish. The saltiness of the seaweed with the warm rice and the tender fresh fish was so good. Simple, but flavorful and delicious. I love crab hand rolls! This was also very light and delicious. The crab was creamy and it just makes such a difference with warm rice instead of cold! These hand rolls are good with a little soy sauce in my opinion. I highly recommend trying Sugarfish. 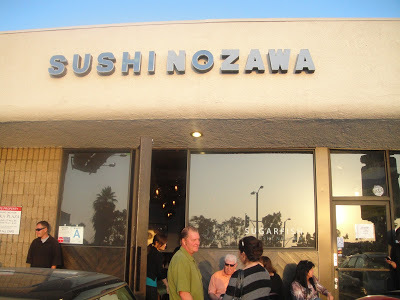 It’s such a change of pace from your typical sushi restaurant and the quality of fish is incomparable. On the menu, order either of the three packages: the “Trust Me”, “Trust Me Lite” if you want less food, or the “Nozawa”. That’s all you have to know when you go there. Enjoy! There are locations in Studio City, Brentwood, Downtown LA, & Santa Monica.